1. First marinate the tuna. Thinly slice two-thirds of the lemon gass stalks starting at the thin add. Pound the remaining thick woody third of the stalks until split. 2. 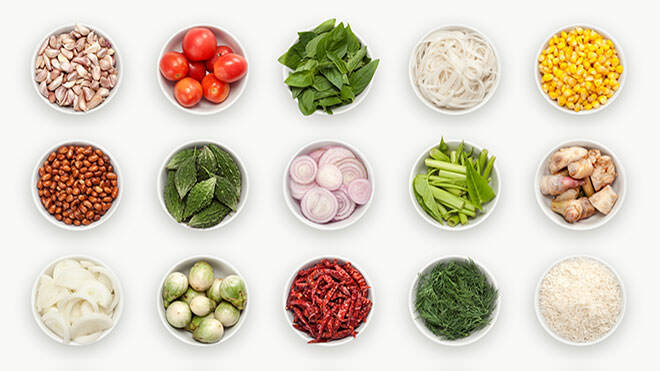 Place the chopped and pounded lemon grass, garlic, chilli, lime leaves, basil, ginger, lime juice, soy sauce, fish sauce, sesame oil and vegetable oil in a container, mixing well. 3. Add the tuna steaks and coat thoroughly in the marinade. Cover and marinate in the refrigerator for 30 minutes. 4. Meanwhile make the aioli. Place the lemon juice, lime leaves and mayonnaise in a blender and blend thoroughly until no large pieces of lime leaves remain. 5. Add the salt, pepper, chilli pepper and garlic and blend until thoroughly combined. Pass through a fine sieve and set aside until serving. 6. Preheat the grill. Season the marinated tuna steaks with salt and freshly ground pepper. Grill the tuna briefly, ensuring that it is still rare. 7. Garnish the freshly grilled tuna with mizuna and serve at once with the lime aioli and a salad.